A simple introduction to plant biology for kids, plus more garden-themed learning activities that pair beautifully with picture books listed in the post. I am a huge fan of teaching plant biology for kids – they have a natural fascination about the world around them, and they remember scientific terms easily. Spring is a great time to start gardening with kids, and you don’t have to wait for spring temperatures to get started! Plant biology is also an activity that pairs well with this week’s Virtual Book Club for Kids theme: Garden. The Tiny Seed by Eric Carle is this week’s featured book. The Curious Garden is another wonderful picture book for this theme. Having live plants in your home is a wonderful way to teach kids about the importance plants attach to sunlight. 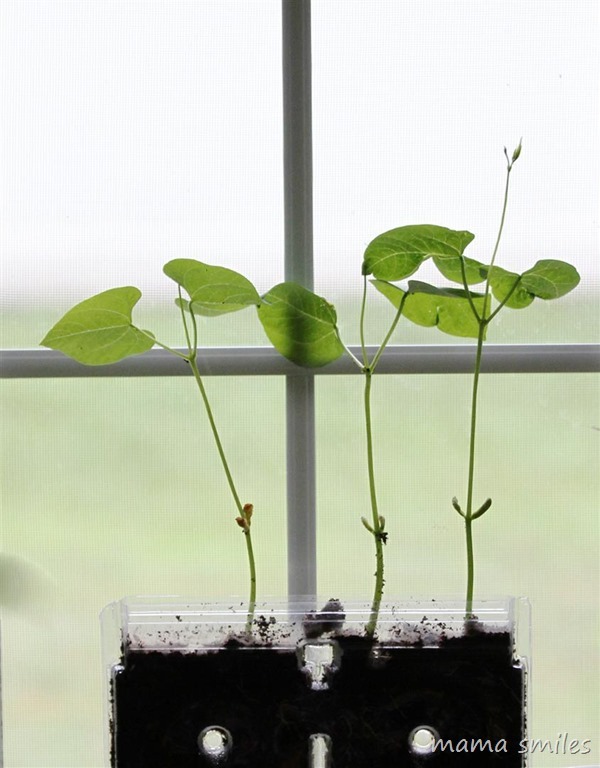 You can use a seedling to show how plants follow the sun, or larger plants like these bean plants! If you look at the photo, you will see that the plant’s leaves are turned so that they can absorb as much sunlight as possible. Turn the planting box, and the leaves will turn again to follow the sun! Chlorophyll is a pigment that makes the leaves green – and it absorbs the sunlight, which it needs for photosynthesis! A very basic explanation of photosynthesis is that the plant takes the sunlight that it has absorbed through its leaves along with carbon dioxide it gets from the air and water that it gets though its roots. It combines these ingredients to create the sugar that the plant needs to grow. You can use any plant in any container to teach this lesson, but thinner, see-through planters like the one above are cool because you can see root systems so well. A zip lock bag also works – there is no need to get fancy, but this was a birthday gift that Emma really enjoyed last year. You can also plant seeds in a jar, or even a simple Ziploc bag. Do you know of other books that I should add to my list? 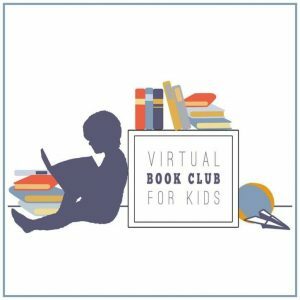 Click on the image above to see all of the themes, books, and activities for this year’s 2016-17 Virtual Book Club for Kids! I am updating the page as new posts go live. Do you have a garden-themed picture book we should read? How about a plant biology experiment for the kids, or another garden-themed activity? Please share any ideas you have on my Facebook page, or tag me on Instagram. Share comments and feedback below, on my Facebook page, or by tagging me on Instagram. Sign up for my newsletter to receive book recommendations, crafts, activities, and parenting tips in your inbox every week. Herbs are wonderful plants for children to grow. That is a very cool planter! And your post reminds me to point out to my kids how the leaves turn on the two (very hardy) plants I’ve managed to keep alive in our house. Congratulations on keeping two plants alive! Someday I want to try the “train a bean plant through a maze thing,” it looks so cool. That’s a cool idea! Maybe we’ll give it a try. Awesome!! RAFT has kits for making plants grow out of CD cases that look very similar. J too received a science kit for his birthday (on colors and such). He’s been asking to do it recently. We’ll probably break it out this week for some much needed 1-on-1 time. We also are learning about plants since we planted our garden on this beautiful past Saturday. During the process, J was explaining photosynthesis to me! I might have him repeat it, so I can post it. How fun! I have heard of RAFT but haven’t checked out their products, yet. I love these planters. We are currently have a bean race to see which types of beans (from the kitchen) grow the fastest. The lentils are winning. What a fun idea! We may have to copy your experiment! I do love growing plants with kids too! What a great idea to have a planter that is transparent! That is a great planter! We have an avocado seed growing in a jar and are having a lot of fun watching it grow. Great idea to use something clear so the kids can see the root system. Such a great lesson! Funny, I just recently saw these window seed boxes and thought they were very neat. I also saw one for attaching to the outside of the window for a bird’s nest. A bird built a nest between one of our windows and the screen and it was wonderful to peek on the baby birds. The kiddos and I spent the entire day outside yesterday planting. It was such a joy! Ah growing plants, just goodness. The bird’s nest window attachment sounds fantastic! And how neat to have birds nesting right next to your home! I can’t believe I haven’t talked to my son about photosynthesis! Thanks for the idea and the inspiration, MaryAnne! How awesome that your plants are growing. We — my son and I — built a soda bottle ecosystem but so far nothing has sprouted. It might be too cold here still.